On Sept. 25, we were supposed to have an explanation. We were supposed to look into the eyes of the fearless leader we elected and receive a transparent answer behind the necessary budget cuts to post-secondary education. We were supposed to know why Mount Royal had to graciously give up its Engineering, Theatre arts, Music Performance, Disability Studies, Forensic Studies, Journalism Certificate, Perinatal/Neonatal and Studies in Aging Certificate programs. We were supposed to know why enrollment is being cut by almost 500 students. I guess Sept. 25 really wasn’t our day. Shame on us for expecting to be prioritized by a government we leech off of. 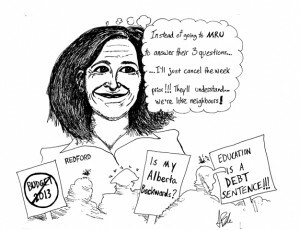 On Sept. 23, the Reflector was offered a chance to interview the Premier of Alberta Alison Redford, on the day she was supposed to speak to students at Mount Royal University. We at the paper, like many others at this institution, were excited for the opportunity to have a conversation with the, likely, normal human being Ms. Redford is, and gain some insight into why students around the province are feeling the crunch of the 7.3 per cent cut to post-secondary operating grants. The Reflector has yet to hear back from the Premiers office regarding the request after leaving a voicemail. Rather than criticize this poor woman who clearly has many events on her schedule, we at the Reflector figured we could push this request onto you the students of Mount Royal — all of whom are members of the Reflector Society and therefore potential employees of this newspaper. Please call the Premiers Office and request an interview with the Premier at 780 427-2251. Say that the Reflector was promised an interview. Any and all interviews that the Honorable Premier Redford answers will be published.